A long time social sector professional, Raynelle began her career in the sciences as an ecology field researcher then moved onto environmental education and social justice at the grassroots organizational level in the San Francisco Bay Area. Her love for nature and youth development brought her to teach in unique settings like alternative high schools, environmental justice neighborhoods, parks, and juvenile justice facilities. In 2016, Raynelle founded Rino Consulting Solutions, a nature-based consulting firm that provides coaching and consulting services for professionals and other businesses. It’s mission is to support and inspire the leaders of today to live in the confidence of their identities as they move through a world in the midst of social, racial, and environmental transformation. Raynelle is a graduate of Humboldt State University with a BS in Biology, a Rising Leaders and 2042 Today fellow, and lives in Oakland with her husband and daughter. Dumebi is one half of the Light SisterZ and a transformational and spiritual coach specializing in Ancestral and Past Life Healing. Dumebi got her start on her spiritual journey around the same time she met Teaira — in college at Ohio University. Dumebi has always had a passion for two things: supporting youth and furthering her spiritual development. As a native Nigerian, she brings an international view to Western education and learning, having worked as both a youth mentor for most of her life and then an educational consultant for four years following her graduation. She’s also continued in her spiritual study by getting a Master’s degree in Metaphysical Science. She is an ordained minister, certified Theta healer, and a certified Reiki Practitioner. Dumebi stepped into her role as a spiritual healer when “attending” training with Teaira. They realized they were answering more questions than they were asking, and with the instructors encouragement, Teaira and Dumebi officially joined forces and the Light SisterZ were born. Chase is a New York City based spiritual consultant, professional astrologer and magical community builder. He is the founder and organizer of the Bay Area Healers Market and hosts a number of events that are centered around holistic health, healing and education. Chase's practice as a spiritual consultant combines the elements of food, herbals, flower essences, Buddhist thought, bodywork, energetic space clearing and utilizes astro-therapy as the primary tool for counsel and diagnosis. The core principle of his work guides people to deepen their understanding of their own individual essence. He is deeply passionate about the intersection of physical, mental and spiritual health and the dynamic journey to achieve and maintain that balance. He believes that through true inner inquiry, the compassionate awareness that is reached will ripple out into all facets of one's life. Check out his website for more details. Teaira is one half of the Light SisterZ and a transformational and spiritual coach specializing in Dream Interpretation. Teaira got her start on her spiritual journey around the same time she met Dumebi — in college at Ohio University. At the time she was focused on her own spiritual development while she was earning her degree in Child and Family Studies. Growing up in a family that fostered children, her passion for supporting youth runs to her core. In the four years following graduation she went on to work in education and the nonprofit sector with children and families in low-income communities. But as a consummate spiritual learner, she continued in her spiritual study by getting a second bachelor’s degree from in Metaphysical Science, earning a certification in Numerology, and specializing in Dream Interpretation. Teaira, together with Dumebi stepped into their roles as spiritual healers when they were “attending” training, and realized they were essentially teaching the class. With the instructors encouragement, Teaira and Dumebi officially joined forces and the Light SisterZ were born. Free for Real Kitchen is a home for traditional foods and ancestral ways of eating that promote health for body, mind, spirit, community and planet. Diagnosed with lupus and diabetes in his teens, Nico has been on a journey of healing for over half of his life. In 2013, he founded a bakery and catering business based on the belief that food is medicine and that our bodies function best when eating the ways our ancestors ate. In modern terminology, this means that the Free for Real menu focuses on ketogenic, paleo, gluten-free, low-glycemic and vegan recipes using organic or sustainably-produced ingredients whenever possible. 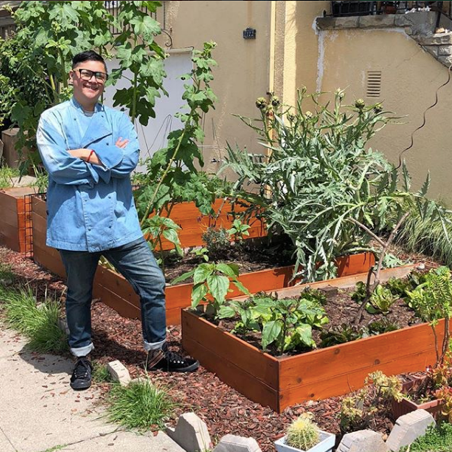 He is proud to feature the flavors and healing ingredients of his Mexican and Filipino ancestries and encourages others to find the healing traditions within their own ancestral cuisines. Nico hopes to lead through example as a decolonial cook, educating and feeding his friends, family and communities so that they can be happier and healthier as they fight for freedom for our peoples and to defend our Mother Earth.